Welcome to our website, featuring some of the fine custom furniture created over the last twenty years or so by Alf Sharp and an occasional assistant. Most of the furniture crafted here at Alfred Sharp Cabinetmaker is specially commissioned, and one-of-a-kind. Workmanship is of the highest caliber. We enjoy intensely the process of collaborating with discerning customers over a piece of furniture that will be perfectly designed and executed to satisfy their specific requirements. Our work is done in the old-world manner, one piece at a time, and no compromises are made in materials or workmanship. 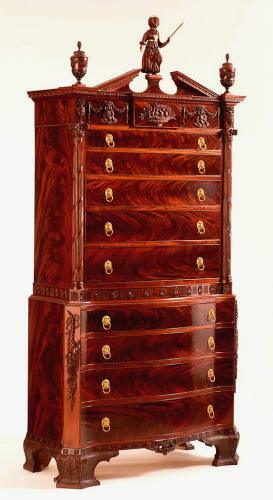 Alf is a master of high and low relief carving, inlay, marquetry, and French polishing. Commissions are accepted in most historical styles, as well as contemporary and original design. Alf Sharp has over thirty years in the studio furniture field, and has completed fine commissions for a number of historical homes and museums, as well as many private and corporate clients. 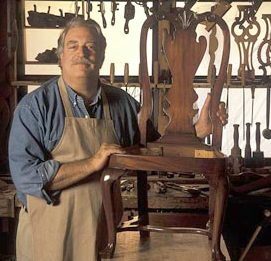 He is an officer or board member of several related arts institutions and is well respected inside the ranks of the furniture-making community, as well as among designers, curators, and collectors nationwide. The images you can view here are just examples of work that has been accomplished in behalf of selected clients. We are not restricted to any styles or patterns, and can work from photos, drawings, scaling an original, or original design. Visits to the workshop are encouraged, by appointment. I look forward to discussing with you building that perfect piece of furniture you’ve never been able to find anywhere else.